This week, Southend Fleetline 232 has been stripped of external panelling and lower deck flooring to reveal the extent of the rebuilding work required. The floor supports are severely corroded, particularly around the front & rear wheelarches and centre door (which doesn't leave much in good condition!) and this area will require complete renewal and then a new floor. 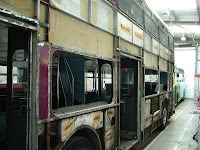 Externally, the main frame is in good condition but the steel 'top-hat' section where the panels rivet onto are badly corroded - and again will need renewing. 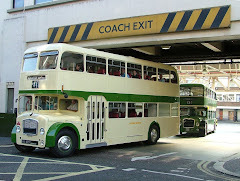 The BusWorks has fabricated a template for the top-hat section that will suit other Northern Counties bodies. Open-top Bristol LH ready for service!